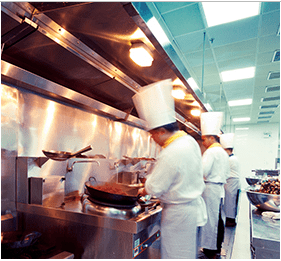 Any restaurant worker can list the hazards inherently present when working in a busy kitchen. Similarly, any veteran restaurant worker can probably tell you a plethora of war stories and unfortunate accidents that have occurred as a result of unobserved safety regulations. Open flames, sharp knives, and frying oil are just a few of the dangers restaurant workers face. These factors within a crowded, high-pressure environment where everyone is racing to prepare a quality meal within a fixed amount of time on greasy, slippery floors is an accident waiting to happen. An effective way to significantly reduce the likelihood of an accident occurring ([LINK 1] by half, according to a study performed by Liberty Mutual) is to ensure that your staff is supplied with high-quality slip-resistant footwear. It’s not enough to merely try to keep the floors clean—all bets are off when the restaurant is busy and your wait staff is in the weeds. Grease, melted ice, and other spills are inevitably going to build up on the kitchen floor, creating a hazard for workers trying to prepare food in an expedient fashion. Our Birkenstock Restaurant Clogs and Shoes are the perfect choice for your restaurant staff. For a limited time, we’re offering free shipping on all Restaurant Clogs and Shoes.